For more than one month now, I’ve been working on a daily basis on Printrun, one of the most used 3D printer host softwares (the thing that sends G-Code to your printer and lets your monitor how things are going). I had already given it a bit of love in the past, doing some internationalization and translation work, splitting the GUI code into a more manageable class-based patchwork or reworked the serial connection bits, but this batch of changes has much more influence on the user side. 13:52:12 < Kliment> On the sixth day, Kliment created the pronterface and the pronsole, and saw that it was…pretty crap. Then iXce came and helped out. I initially came back to hacking Printrun because I thought loading G-code files was really too slow, and I quickly figured out that it was mostly due to the fact that we were parsing the G-code several times (there were at least 6 different G-code parsers in the code, and loaded G-code was parsed at least three times immediately upon loading). By rewriting and merging all those parsers, I was able to reduce the startup plus file loading plus visualization preparation time from about 13 seconds to 4.5 seconds on average, using a 3.8MB G-code file of about 140000 lines, while the new parser is also doing more things than the old ones. The previous remaining print time estimation was simply doing a cross-multiplication between elapsed time, number of sent G-code lines and number of remaining G-code lines, which happened to be very wrong in many cases: the early estimations were completely biased by the fact that we usually print the first few layers at a much slower speed than the other ones, and average G-code time means pretty much nothing (a long line can be 1 single G-code, while a tiny circle can be 50, while printing the line can take 20 seconds and the tiny circle less than 2, so you can have some G-codes which take 500 more time than some others). Thanks to the fact that we now have a complete understanding of the G-code (or actually just because we store more meta-information), we can now compute a much smarter estimate, based on the estimated total duration (the one you see after loading the file) computed on a per-layer basis, which we correct by incorporating a bias computed between this estimation and the actual print time for the elapsed layers. This way at any time the ETA should be within 10% of the actual ETA (unless you have a very, very weird machine), and should get closer and closer over time. 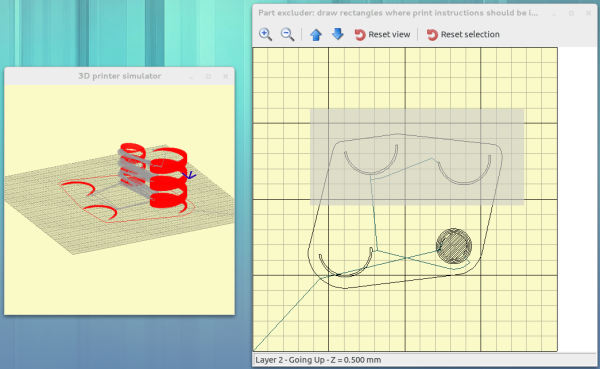 The 2D print visualization was really slow, and was even known for slowing down prints because screen refreshes were taking too much time. The drawing code was indeed redrawing every single line on each refresh, which would happen once for each sent G-code. We now buffer drawings as much as possible: complete redraws only occur when changing layers or resizing the canvas, every other refresh is done by updating a buffered bitmap with the newly added lines and drawing it to the screen. 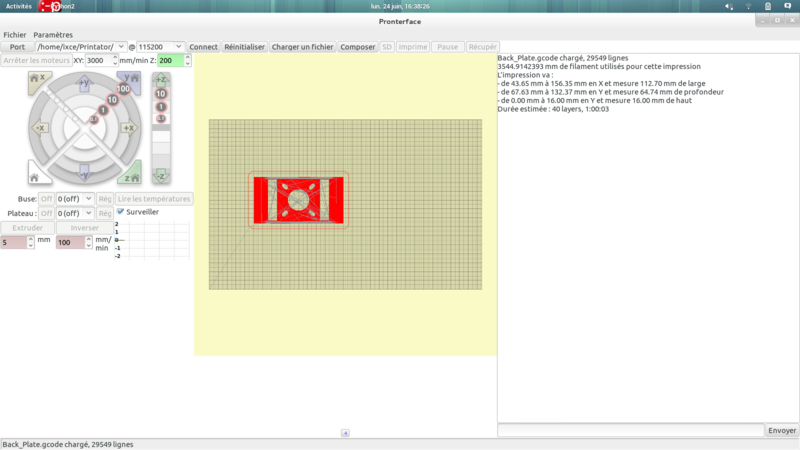 Visually, not much has changed except that the print bed extents should appear in a cleaner way (the yellowish background color does not leak anymore), that the grid should correctly start in the bottom left corner, and that thanks to other interface changes the resizing behavior should be much nicer. Even better than optimizing the 2D viewer, we added a proper and very fast 3D viewer, based on tatlin, a standalone G-code and STL viewer originally built on GtkGLExt and PyOpenGL, which we ported to Pyglet so as not to add another dependency, and adapted it to use our already parsed G-code. As it uses the GPU to do most of the drawing (we store the model to display in GPU memory if possible, so that the CPU only has to tell “print from this vertex to this vertex with this color or GPU-stored color array”), it’s super light for the CPU, and as it’s done in 3D we can zoom (and zoom to point of interest), pan and rotate in 3D almost for free. Another nice improvement was the addition of a clean options dialog, with options grouped in different tabs and being displayed with appropriate widgets: checkboxes for boolean options, combo boxes for multiple-choices options, spin buttons for numbers, text fields for text options. 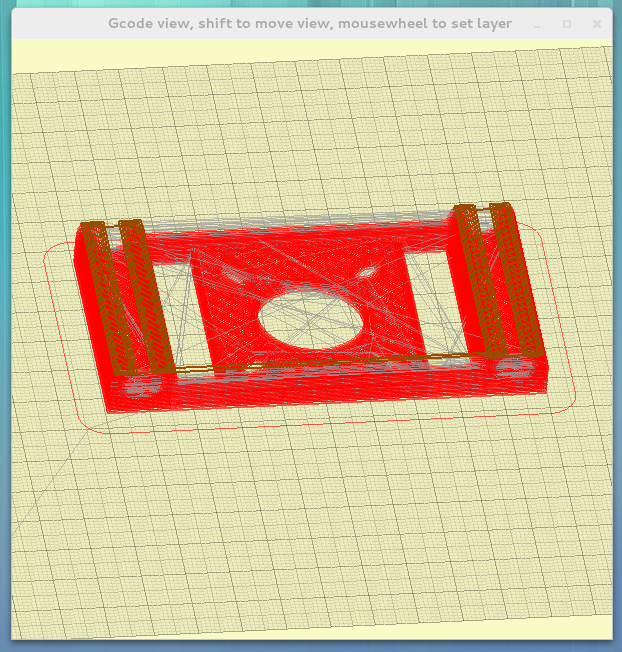 This is probably the most original addition: a G-code based part extruder. How many times have you had a single part fail on a big build plate and had to stop everything just because the plastic was not being correctly deposited on the failed part and started messing up the whole print? Well, this tool is designed for stopping this kind of situations from happening. 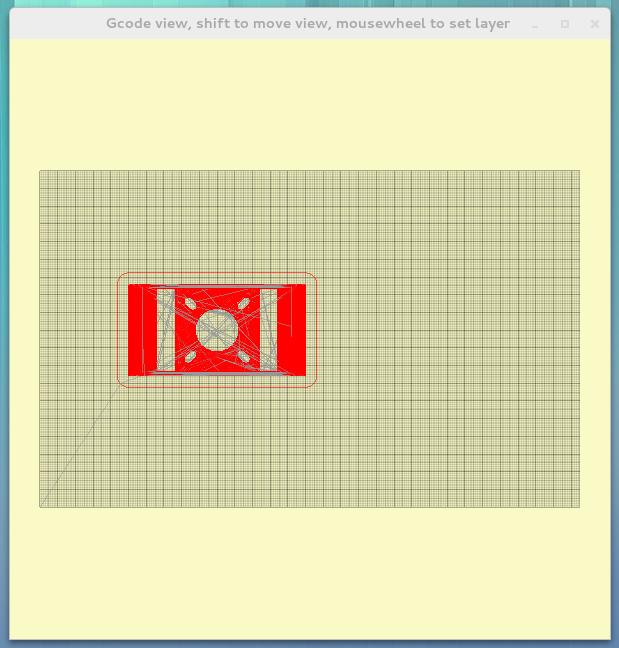 Just hit the Excluder entry of the File menu and draw a few rectangles over the area you want to stop printing, and you’re done (you can also do that to exclude parts of already sliced plates you don’t want to fully print nor reslice without the extra objects). It basically avoids going into the defined rectangles, resetting E values if needed instead of extruding, and seems to work fairly well with Slic3r-generated G-codes (I haven’t tested with any other slicing engine, and it could break because layer changes have to happen independently of X/Y moves for now). The second mode is much more different. 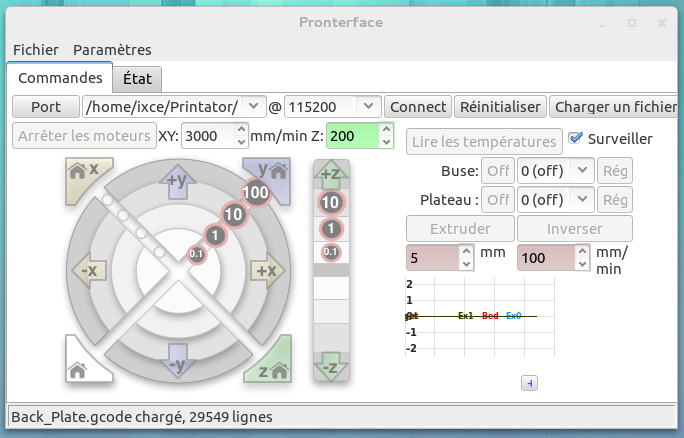 It splits the interface into two tabs, the first one holding all the printer controls, while the second one holds the print viewer and the log box. 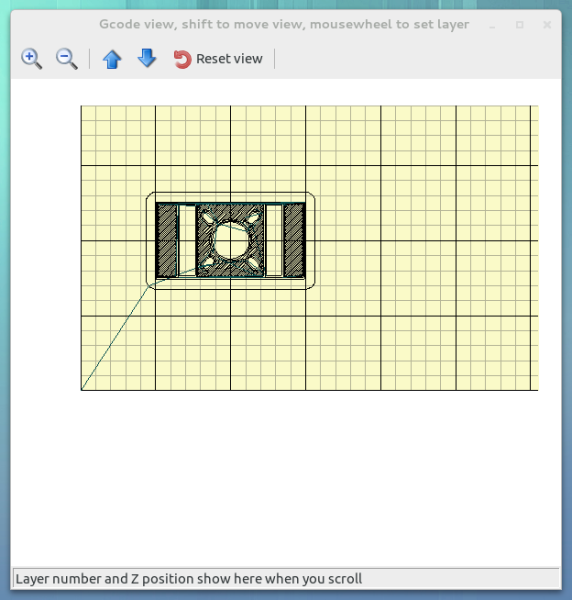 This makes it super compact and very well fit for tiny screens (it should fit in 700×600 pixels), especially when using wxWidgets 2.9 where it will use an appropriate widget for the main toolbar which wraps around automatically. 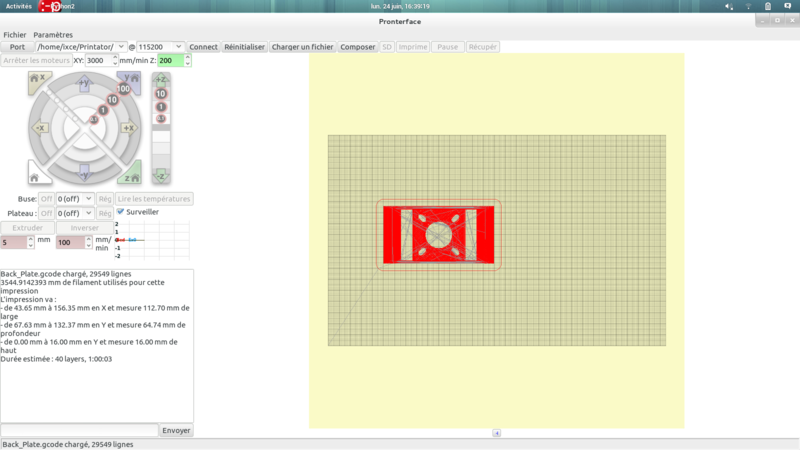 This entry was posted on Monday, June 24th, 2013 at 4:30 pm	and is filed under Code, RepRap. You can follow any responses to this entry through the RSS 2.0 feed. You can leave a response, or trackback from your own site. My god that is nice, where do I download? 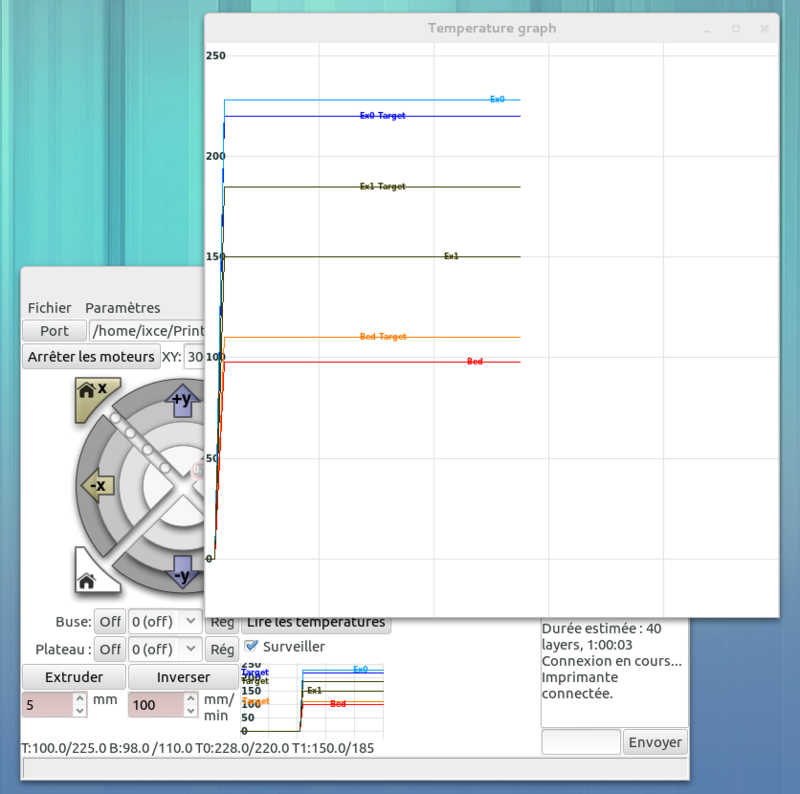 Everything is readily available from experimental branch (https://github.com/kliment/Printrun/tree/experimental), and most things (except the Excluder tool and the larger graph) are available as binaries for Windows and OS X from Kliment’s http://koti.kapsi.fi/~kliment/printrun/ (he should be doing a new round of binaries soonish, there are also some memory usage reduction changes which are quite major since the last round). hi, hey, thanks for all this, but the git page is down, so source is not available (afaik), and the ports only cover win and mac, but i’m running ubuntu. 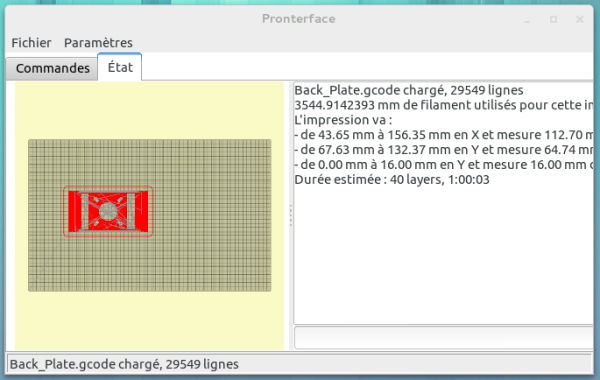 i’ve got some large .gcode files and printrun is bringing down ubuntu 14.04 (desktop). i was looking for maint or a new release so i could print my stuff. Entries (RSS) and Comments (RSS). 29 queries. 0.121 seconds.